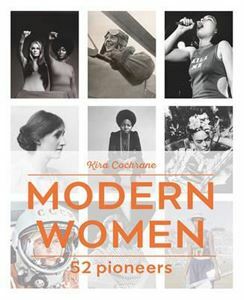 Modern Women is a celebration of some of the- influential and inspiring women who have changed the world through their lives, work and actions. From suffragettes to scientists, activists to artists, politicians to pilots and writers to riot grrrls, the women included have all paved the way for gender equality in their own indomitable way. Find out about extraordinary women including writer and teacher Maya Angelou, computer scientist Ada Lovelace, abolitionist Harriet Tubman, film star Katharine Hepburn and pioneering musician Bjork. Their lives also enable bigger stories to be told: the suffrage movement with Sophia Duleep Singh; the civil rights struggle and Audre Lorde; advances in science made by Rosalind Franklin; the push for artistic freedom in the work of Frida Kahlo and Louise Bourgeois; and the importance of equality in all sections of society advocated by Chimamanda Ngozi Adichie. A fascinating and unique anthology about contemporary women campaigners and how they were changed by the process of changing the world.